Boston, June 11, 2016, — Boston Bilingual Media & Publishing (BBMP) Inc. held a book preview party at Empire Garden restaurant in Chinatown at noon time on June 5. Dragon’s Teeth – Arthur Wong’s Journey from Taishan to Normandy was previewed at the party with about 60 people attending. 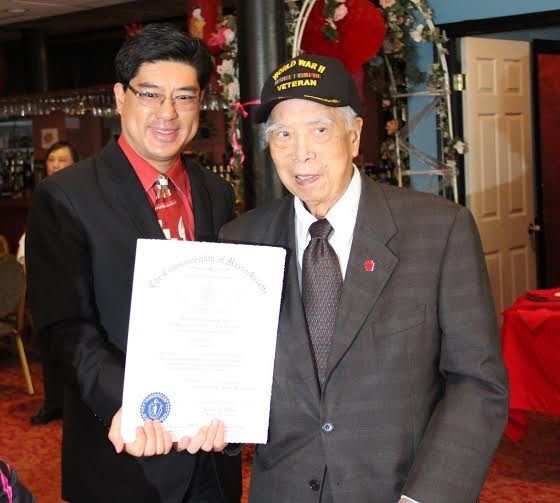 State Rep. Tackey Chan and Annie Qin, representing Boston City Council President Michelle Wu brought citations for the 72th anniversary of Mr. Wong’s landing on Omaha Beach on D-Day, June 6. 1944. Tackey Chan presents citation from MA House of Representivies to Mr. Wong. The party was hosted by Peter Chan, who wrote both Chinese and English poems for this occasion. Paul Chan, president of CCBA New England, called Mr. Wong Uncle Arthur, and recalled that his father also fought in WWII for Chinese Army. 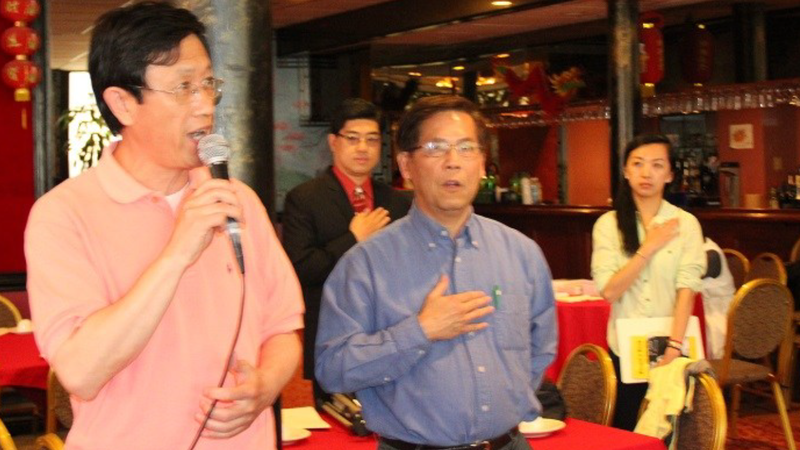 He thanked Mr. Wong’s long-time services to the Chinese communities after the war. Joe Li sings National Anthem at the start of the party. 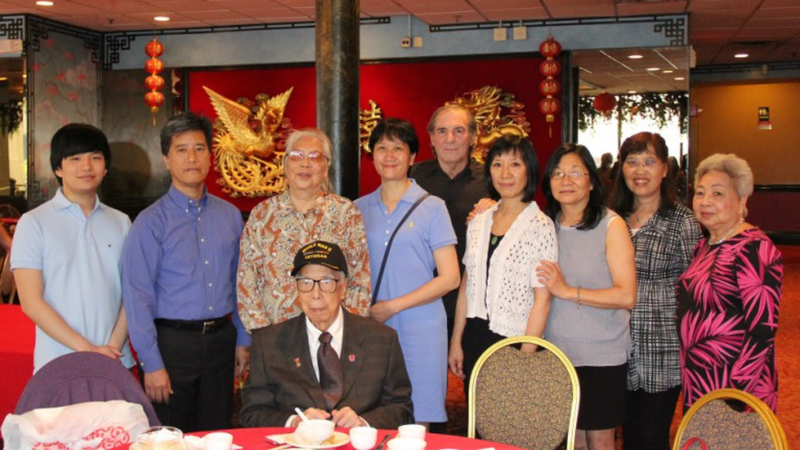 Rep. Chan and Annie Qin thanked Mr. Wong for his service to the country during WWII and post war. They wished him good health and continued success. Qin also presented Boston City Council resolutions to co-authors David Li and Changhong Zhang for their effort in documenting the life stories of Chinese American heroes like Mr. Arthur Wong. Dragon’s Teeth is a biography of WWII veteran Arthur Wong, a 92-year-old resident of Boston Chinatown. Author David Li interviewed Mr. Wong for over 50 times while writing this book. The other author of the book is Changhong Zhang, a graduate student at Emerson College. Rich Wong, song of Arthur, wrote foreword for this book. Arthur Wong immigrated to Boston in 1938, and was among the first groups of American soldiers who landed on Omaha Beach on D-Day, June 6, 1944. He was later seriously injured in November 1944 when the Allied Forces advanced into Germany. Sixty-four years after he returned from WWII battlegrounds, Mr. Wong finally received nine U.S. military medals, including Purple Heart and Bronze Star, with the help from Senator John Kerry in 2009. According to Boston Bilingual Media and Publishing (BBMP) Inc., the final version of the book will be released next month. For more info about BBMP Inc., please visit bostonese.com/book.